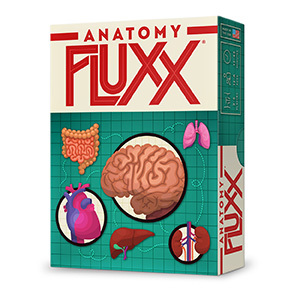 Anatomy Fluxx is the newest addition to Looney Labs education line and takes you deep into the human body. From Bones to Blood Vessels, Anatomy Fluxx is packed with all the body bits that keep you ticking. But be on the lookout for Virus, Mutation, and Bacteria Creepers! Plus, two Learning Rules will get your Brain in gear with anatomical trivia. Anatomy Fluxx - for external use only!